July 1 marked the start of Victoria’s 16th annual Ska and Reggae Festival, a five-day rotation of solo acts, bands, DJs, collectives and artwork showcased at Ships Point by day and our city’s local club venues by night. Having only attended one show last year, I was blown away by the talented performers from as close by as our own island and as far south as ska’s birth place, Jamaica. 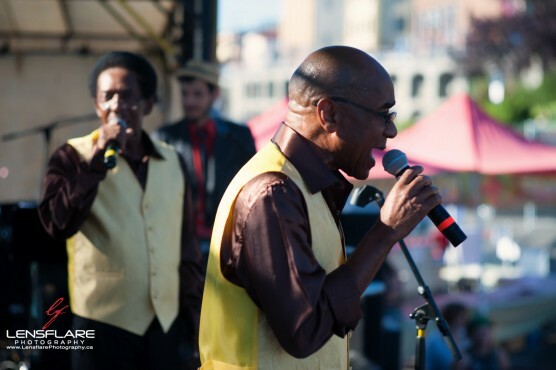 Kicking off day three of Ska Fest were “rocksteady pioneers” Keith & Tex taking the main stage in matching gold vests. Opening the show with “Tonight” from their 1967 album Stop That Train, they were accompanied by Brooklyn New York’s The Slackers, dressed in all black. Despite the heat, the crowd was dancing by the end of the first song. Having just released an album this year, the setlist was an upbeat mixture of fresh tunes and classic tracks from the duo’s first years together in the late ’60s. It was no question that these guys were back doing what they loved; Keith and Tex jumped in time with the drums and shouted out to the sea of faces with wide smiles and waving arms. 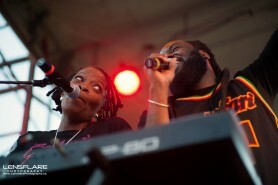 The pair bounced back with the enthusiasm and excitement of true reggae legends singing an encore of their well known hit “Stop That Train” before handing the stage over to The Slackers. The Slackers took the stage for their last show before returning to New York state after a three-month tour, with Jesse Wagner of The Aggrolites temporarily filling in on guitar. After accompanying the “rocksteady pioneers” for a full set, they jumped to center stage for a dramatic and riveting performance. Bassist Marcus Geard, dressed in black while backing Keith & Tex, donned a clean white suit, and the horn section called for attention with eccentric solos passed back and forth. From my view on side stage the crowd was a stormy sea, the waves swaying and bobbing in different ways to one tune. No one was still, not even seated drummer Ara Babajian, who was nodding in threes and fours while carrying the song with every limb. Rocking over the folks dancing below with fingers dancing over keys was saxophone player Dave Hillyard as flailing crescendos soared into the sky. Standing in for usual guitar player Jay Nugent was Wagner, who sang one of The Aggrolite’s songs, “Countryman Fiddle,” between the fast tempoed Slackers set list, which included their hit “Have a Time.” Lyrics were tossed between Glen Pine (also spilling breath into a trombone that dashed around the stage with him) and keyboardist Vic Ruggiero. One of The Slackers’ founders, Ruggiero exchanged instruments and took the center mic with his guitar for several songs as the horns disappeared off stage. The band’s frontman was staying in Victoria over the weekend to play a solo show at Floyd’s Diner on Sunday night, with these few tunes offering a compelling prelude. As Friday sunk into the horizon, Ships Point erupted in cheers and applause both thanking such a performance and welcoming the next band all the way from Jamaica: Morgan Heritage. The group of nine is lead by five siblings: Peetah, Una, Roy, Memmalatel and Nakamyah Morgan, the children of reggae artist Denroy Morgan. Onlookers were hooked with opening tune “Neighborhood Girl” sung by Roy’s son Jemere, who got the crowd to sing the chorus along with him. Each musician took their chance at captivating Ska Fest with stupefying solos carrying each song into the next. Lead singer Peetah invited audience members to join in on their journey of spreading love and unity through their deep passion for music. 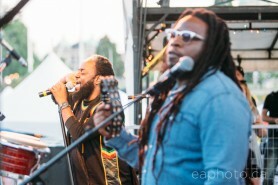 Having arrived in Victoria only two weeks into their current tour, Morgan Heritage got everyone dancing with the title track off of their newly released record, Strictly Roots. Although it is the band’s 17th studio album, it is the first under their very own label Cool To Be Conscious (CTBC), and comprised the majority of the tour’s set list. Heading to San Francisco first thing the next morning, the group ensured a memorable and electric Ska and Reggae Festival debut. The music ended with an encore of “Jump Around” leaving the crowd excited, rejuvenated, and raring to continue with Ska Fest’s night time performances at Sugar nightclub. Jumping, dancing, and belting their finale through every instrument, Morgan Heritage put on a show not to be missed by any reggae enthusiasts. 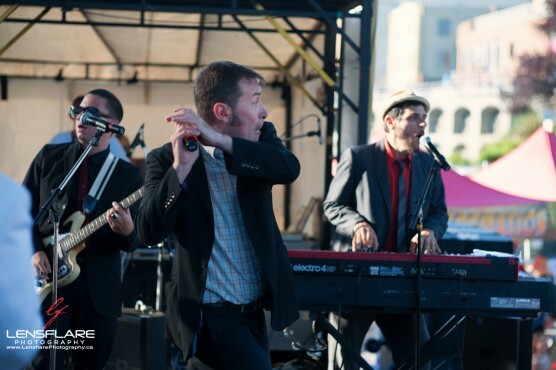 Editor’s note: A previous version of this article stated that the Slackers were playing “one last show” in Victoria, but wasn’t clear if it was their last show indefinitely; it was in fact the last show of a three-month tour before they returned to New York state. The article has been edited to clarify.